January is National Teen Driving Awareness Month, and with the beginning of a new year, it is good to think about ways to improve and enhance our lives and the world around us. In honor of National Teen Driving Awareness Month, attorney Mike White appeared on WAKA CBS 8 and WBMM CW 22 with host Olivia Deas, to discuss teen driving safety. It is important to discuss with your teenage driver accident stats and tips to keep them safe on the roads. According to the CDC, car accidents are the #1 cause of death among teenagers. In fact, 6 teenagers lose their lives in car accidents every day. This number is staggering, so if a little extra talk with your teenagers helps reduce this number, that is the goal. The highest risk is among new teen drivers, who are out on the road by themselves for the first time with relatively little experience driving. The CDC reports that new teen drivers are 3x more likely to be involved in a car accident per mile driven. One of the leading causes of accidents is distracted driving. Not surprisingly, the number one distraction is cell phones. And this is an easy fix. Don’t use your mobile device while driving. Maybe a rule that you discuss with your teenagers is that when they are driving, the cell phone must be turned off. This eliminates the chance for distracted driving. While checking texts or your Instagram feed may seem like a simple task, doing so while driving is incredibly dangerous, and not worth losing your life or causing harm to others. As attorney Mike White mentioned, teen drivers of today are a unique group of people who have always known a world with cell phones, and typically don’t go a day, let alone an hour, without using one. This is highly problematic, as Mike handles many cases of teen driving accidents that were caused by cell phone distractions. Mike’s advice for parents is to tell teen drivers to put their cell phones in their trunks or turn them off to avoid the temptation to use them while driving. Another helpful tip is to look into a feature that sends a text back to friends and family members who are trying to get in touch with you that you are driving and will get back to them shortly. By keeping these alarming statistics in mind and following these tips, teens should be able to help avoid distractions and keep themselves, passengers and other drivers on the roads safe. If you or a loved one are seriously injured in a car accident that was not your fault, call the experienced Alabama Car Accident Attorneys at Floyd Hunter at 334-452-4000. When you call, you’ll receive a FREE case evaluation. There is never an attorney’s fee due upfront, and we don’t get paid until you do. It’s that simple. We will fight to protect your rights to the fair insurance settlement that you deserve when injured in a motor vehicle accident. 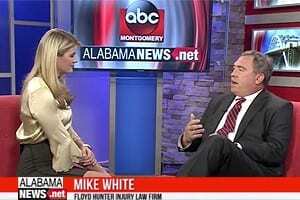 Call Floyd Hunter Injury Law for a Free Legal Consultation at 334-452-4000.